Delicate Arch is the most photographed scene of this area, excluding possibly Monument Valley. In fact, I'll be presenting about five pictures of it in this gallery. 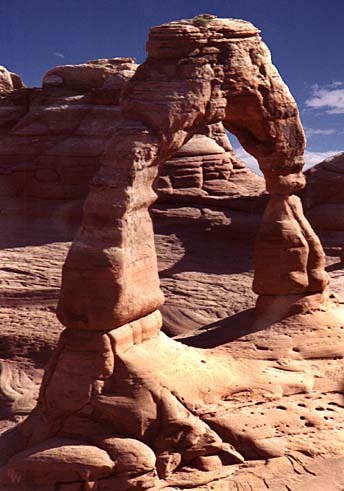 Delicate Arch is located precariously on a huge sandstone slab high above the surrounding landscape, and has a hole in it 46 feet high and 32 feet wide. All contents of this page - Copyright 1997 Moab Internet.